The goal this weekend was ambitious…and as usual…the result was mixed. I’m happy with what I got done, but hoped to get a little further. Due to the heat and humidity, it’s vital to get started early. 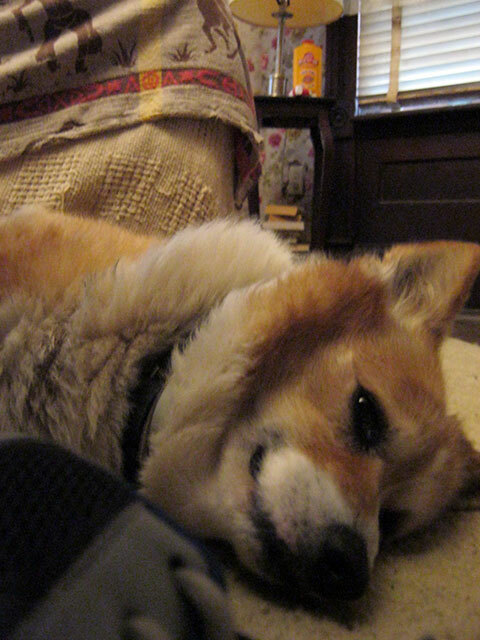 Shorty the Corgi…otherwise known as “Not Morning” dog was less than enthusiastic. Difficulty…threaded togther black-iron pipe…no unions…so it would have to be cut, then unscrewed from the fitting where I wanted to insert a plug. Even with the gas cut off, I really didn’t want to cut the pipe with a sawzall or such as I might ignite the remnants remaining in the pipe. Again, black iron so no “real” danger, but I’d put as #1 on my list for the day, “Don’t Explode”. A pipe cutter was required. I picked up a cheap one since I don’t expect to use something that size very often. While it is not the quality of tool I’d want to try to earn a living with, it was perfectly suited for this cut, and no doubt will serve for any other large cuts I need in the future. 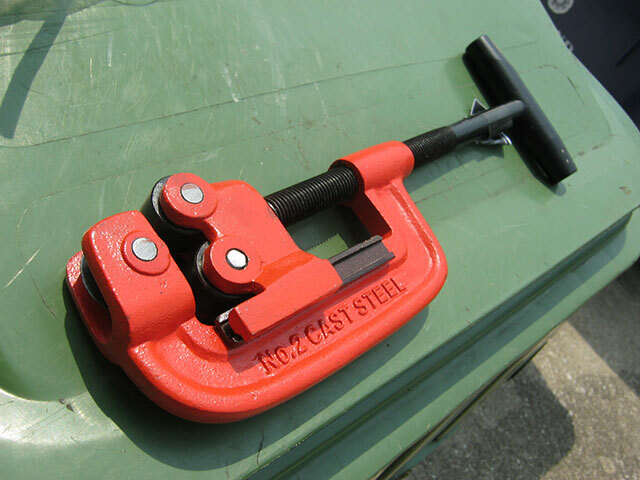 Pipe cutter…good to 3″ pipe. Screw spin…screw spin…screw spin…and the cut was made. Easy peasy. 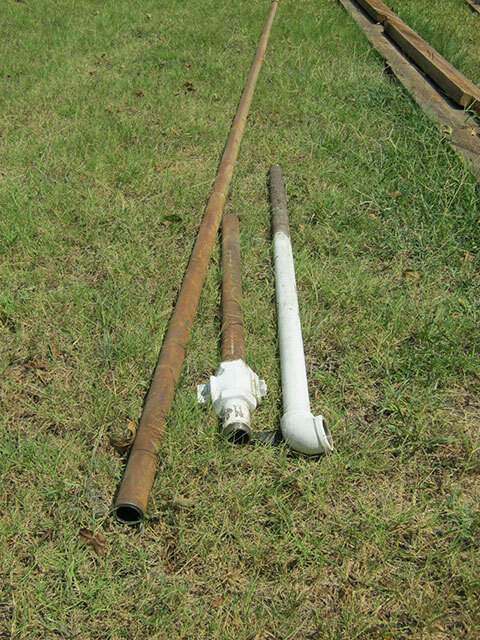 Crawled under the house to the first “T” and attacked it with Mike’s two-foot pipe wrench. Again, easy. Slathered the 1-1/4″ black iron plug with pipe dope and screwed it in. Gas back on, test, and we’re done! And we didn’t even explode. 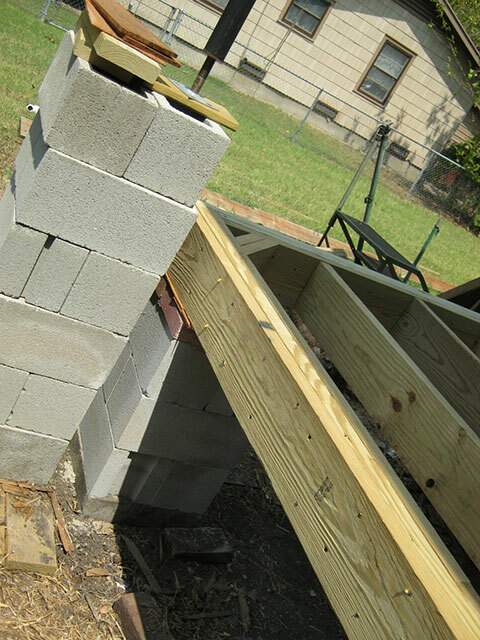 The rest of the weekend, between birthday dinners for my Mom, other food breaks, and lots and lots of water breaks was spent horking (that’s a technical term) very large lumber, cinder blocks and pads, a half-ton of concrete, and a slew of power tools around. 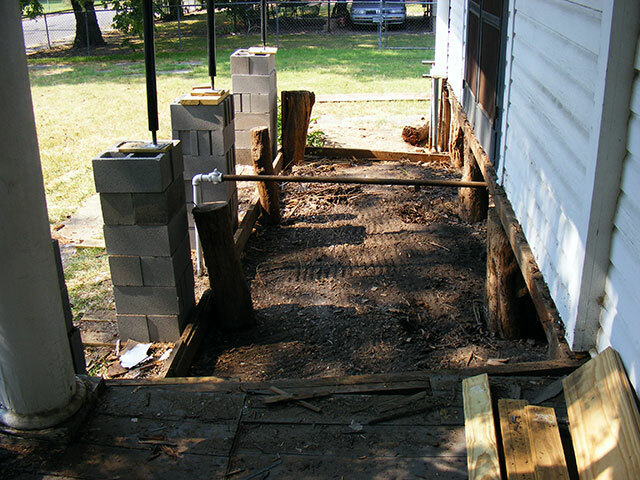 Before we knew it, the 20ish foot straight section of the porch was framed up. Yeah, I was lazy and didn’t move the plywood for a pic…it’s just there for me to walk/sit on while I finished up the screws/nails, and will also assist on moving around while I put down the flooring. The porch framing looking north. The little corner brace…was not technically necessary…but since everything else on this frame job was high into the “overkill” mode, this was added as a 10″ in diameter column sits there, and the corner thingy will take any weight not sitting on the rest of the beams so as to not buckle the flooring. The porch framing looking south. Seven new piers, about 1000 pounds of lumber, notches into the original framing on the house, $30 bucks worth of deck screws, a dozen clips of framing nails, and we have our framing. You could park a truck on this thing. Please don’t. 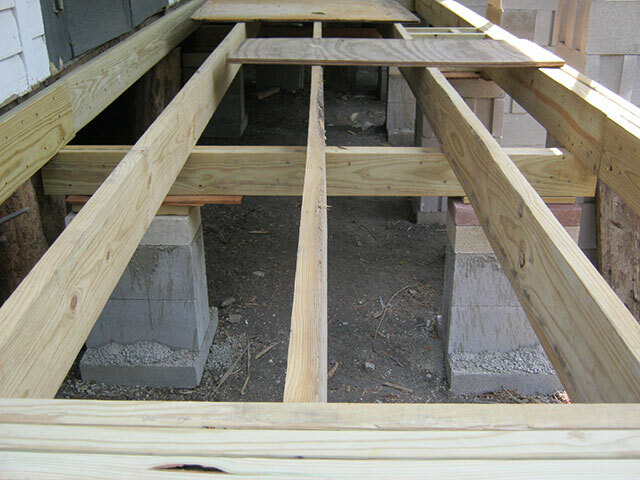 It’s perfectly level for it’s length, and has a 1-1/4″ deliberate slope away from the house to let any wind-blown precipitation that manages to get under the roof to run off instead of puddle. Yes, it’s nailed AND screwed. I like power tools WEEEEEEEE! (I also NEVER want to have to rebuild this again). A big shout-out to my friend Mike for the help! 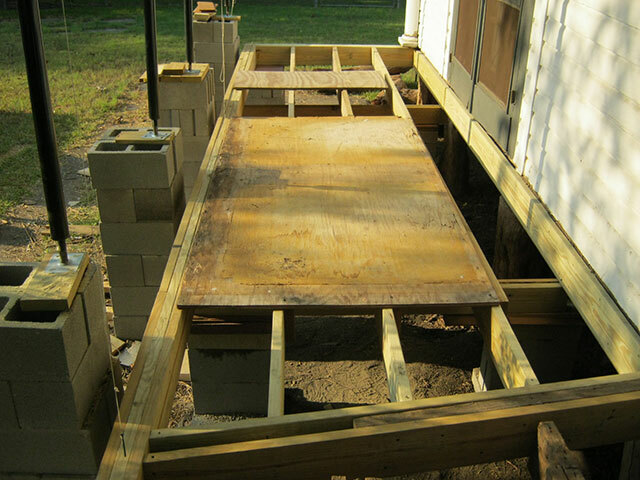 Flooring should go down next weekend…I will tackle the curved section of the porch as a separate project…I need to get the columns/etc back in the straight section so I can use my jack posts on the curved section (vs. buying a few hundred dollars MORE worth). Oh, and in case I’ve not mentioned it here before…these guys ROCK! 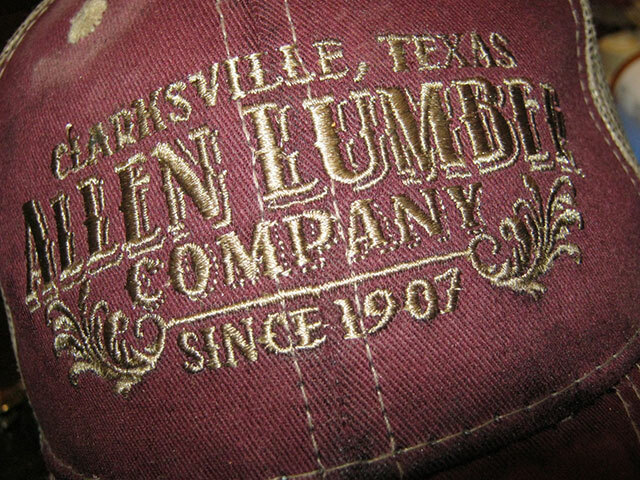 Better lumber than the big-box stores, good pricing, they get me what I need, and they deliver it if needed. If you’re local, stop in and tell Paul Allen I sent ya! In case I’ve not mentioned it before…these guys ROCK! Awwwwww, you know how to take the fun out of things….